Made an order with 11 different items 8 clothing, 3 powders). 3 powders and 3 clothing shipped. The remainder nothing happened so I sent a request regarding it. After 24 hours they said they were out of stock and they would cancel the one item. I sent about 5 emails and in the end they refunded it. It took 3 weeks for it to happen. I've never had to cancel an order that was out of stock. They have no telephone number or live chat. Their customer service takes 24 hours to reply and they don't know anything. +1 to salted caramel and strawberry cream, didn't like much the chocolate brownie. I have 11 lb each opened packs of salted caramel and strawberry cream. If anyone wants I can sell at a crazy discount. Just PM me. There's a code for 45% off now, use "MAD45". Ends in 20 hours or so. I've tried Vanilla, Chocolate Smooth, Salted Caramel and Matcha. Based on this thread, sounds like I gotta try strawberry cream and mocha next time. Also picking up some creatine monohydrate. Just got the email for 45% off too. I just made a big order at 35% off last week... any chance of them crediting me the difference? Vanilla is the bomb. Blend it with frozen milk, mango, strawberry and banana. I add a tablespoon of nutrional yeast flakes for a health boost. Adding salted caramel to my order this time. Worth switching or not? Prices actually seem a bit more than what I've been paying but always curious about different companies! i've used CanadianProtein dating back to before they were bought out as TrueSupplements and I found their isolate pricing has not been competitive after they changed ownership. Checked just now and their isolate is $35 for 2.2lbs. $15/lb is ridiculous. but thats their lowest volume so I checked 11lbs and it brings the cost down to "only" $10.90/lb. Myprotein comes in much cheaper and I can remember even Kaizen from Costco was only $7-8/lb a few years ago when it was on sale a few times a year. 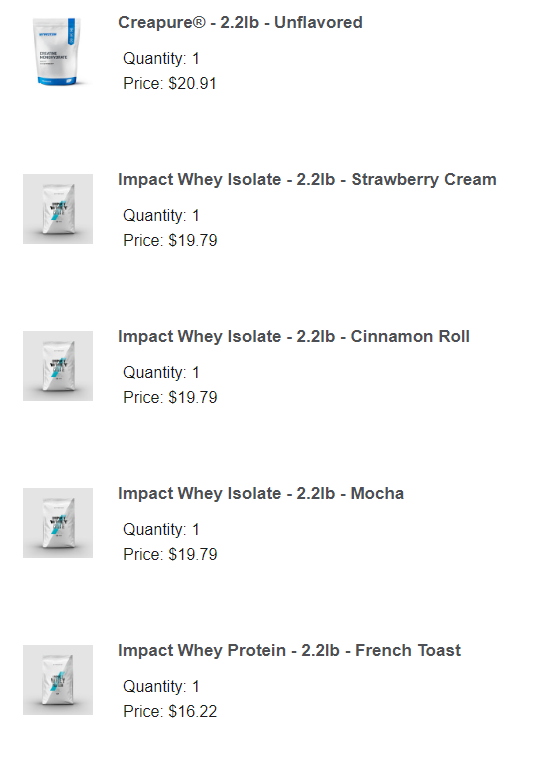 for comparison, MyProtein 11lbs with the coupon code (actually gave 45% off) comes to around $8/lb CAD pre-tax. I was going to place an order based off your information alone so thank you! Last edited by MikeB84225 on Apr 8th, 2019 2:28 pm, edited 1 time in total. Ordered 11lbs x2 of whey concentrate (Vanilla and Chocolate Brownie).